Whale Dangerous earthquake swarm: A series of 11 mid-ocean ridge earthquakes in the Greenland Sea induces barosinusitis in a pod of ~200 pilot whales. (Read how undersea earthquakes cause sinus barotrauma in an entire pod of diving whales. Starting on the night of 13 July and continuing until 18 July 2012, eleven volcanic-tectonic earthquakes struck along the riff valley of the mid-ocean ridge system 56 km (34 miles) NNW of Jan Mayen Island in the Greenland Sea. Some of these events were especially dangerous to diving whales because they were focused less than 2 km deep. These events were associated with volcanic activity at the center of the rift valley. A pod of about 200 pilot whales feeding on the abundant squid in the area were injured (barosinusitis and barotitis media) by the repeated exposure to rapid and excessive pressure changes induced into the water when the seabed danced vertically during this disturbance. Since the air in the air sacs and sinuses of the whale's head serve as acoustic mirrors, and since the air in the middle-ear cavities serve to aide hearing, barotrauma in the sinuses and middle ears knocked out their biosonar and destroyed their ability to echo-navigate along with the ability to dive and feed themselves. The injured pod huddled close to each other for protection against sharks, and swam away from the epicenter in a random direction. In less than a minute, increased resistance to the flow of the surface currents in every direction except with the flow, turned the entire pod and pointed that downstream toward the Northwestern Coast of Iceland. 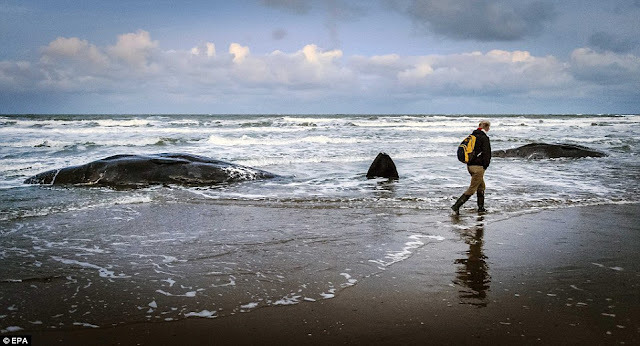 Plodding along at about 3 km per hour inside a 2 km surface current, the seismically-wounded pod arrived offshore near Reykjavik, Iceland on the night of 28 July 2012. They swam about 850 miles in about 5 days, covering about 150 miles per day. In many of the films below, one can see them raising their heads out of the water, looking toward shore, trying to fix the location of the treacherous rocks. Spyhopping indicates the pod is obviously knows their echonavigation is not working. They will continue to swim with the flow of the surface currents which will likely take them toward the southern tip of Greenland. It's doubtful that they will survive long enough to cross the Davis Strait and reach Newfoundland.